With Rascal Does Not Dream of Bunny Girl Senpai approaching the end of it’s run, I figured now would be a good time to write up my thoughts on it, as well as its striking similarities with the ever-so-popular Monogatari series. Admittedly, these series are both fairly new to me as I had, until recently, only seen one season of Monogatari, and I’m fairly certain I didn’t start with Kizu or Bakemonogatari. However once I found a handy watch-order-list I binged the whole series to date in less than a month. And while I cringe at much of the show’s fan-service, I recognize that the discomfort is part of Monogatari’s charm — though admittedly it’s the incredibly clever word puns that keep me coming back… Mostly. But so what? Plenty of shows are cleverly written and rife with fan-service. What makes Monogatari such a hit? Is it the trademark story-telling of apparitions (I mean it fits with the name) that treads the line between mystery and horror? Is it the way comedy finds its way into a story about a reluctant vampire? Is it just because most of the characters are really well rounded and established, to the point where it’s hard to hate even the worst of them? I’m not sure, but that sounds like a really long-winded way of saying that the show is well written. Regardless, Monogatari is a story I quickly fell in love with, and I’m practically begging for a local release of Zoku… So then imagine my surprise when I start seeing more and more mentions of this weird new title that everyone is comparing it to my new favorite show! Intro, Rascal Does Not Dream of Bunny Girl Senpai. Now I’m sure most of you seasonal watchers have already caught up on this show, but if not I’ll plug the Wiki synopsis. Sakuta Azusagawa’s life takes a turn for the unexpected when he meets teenage actress Mai Sakurajima, dressed as a bunny girl, wandering through a library and not being noticed by anyone else there. Mai is intrigued that Sakuta is the only one who can see her, as other people are unable to see her, even when she is dressing normally or attempting to stay away from celebrity life. Calling this phenomenon “Adolescence Syndrome”, Sakuta decides to solve this mystery, while continuing to get closer to Mai and meeting other girls who suffer from “Adolescence Syndrome” as well. Now from that synopsis alone, you may have caught on to some of the similarities already, but in case not I’ll point them out. In Monogatari, only Araragi and others afflicted by apparitions can see them. Wait are we sure this isn’t just the plot to Monogatari? And you know what? You’d be right. However you’ve also probably noticed some similarities between characters as well, haven’t you? Like how both series have main couples with intelligent and strong/borderline abusive girlfriends. Or how both protagonists have an even more intelligent best friend who uses her intellect to fix many of their problems with the supernatural. Or what about how both main characters have imoutos who have an unhealthy attachment towards their oniichan? And of course both main characters make sexual jokes towards all of their female friends, whom they love helping while pretending it’s a burden. So is Rascal Does Not Dream of Bunny Girl Senpai just a ripoff of Monogatari ? Nah I wouldn’t go that far. Heavily inspired? Sure. However there’s a fair deal of content in the one season of this show that I wish Monogatari had. For example the aforementioned fan-service. While Bunny Girl Senpai has its fair share of fan-service, I think it handles it more tastefully than Monogatari. I mean I’ve started to accept that maybe I don’t hate fan-service as much as I let on, but please Ararararagi don’t lewd the lolis! Additionally, I prefer the way it handles the main couple as well. Sometimes I feel like whole story arcs of Monogatari went by without me even seeing Senjougahara, whereas Bunny Girl Senpai includes Mai in the story even when it says it’s not supposed to. There’s also a more relaxed vibe about this show where every incidence doesn’t seem like life-or-death. This isn’t so much a critique against Monogatari, but it’s refreshing to see that Sakuta doesn’t need to rely on vampire blood to regenerate missing limbs every few episodes. However this series is still in its infancy compared to Monogatari, which has been around since 2005. Maybe they’ll continue some parallels, and maybe they’ll wildly diverge. Either way I’m hoping both continue to receive great anime adaptations while I search out their light novel counterparts. I’ll end this post with a question for you. Who do you prefer? Senjougahara or Mai? I find Rascal Does Not Dream of Bunny Girl Senpai to be far less jarring to watch than Monogatari. Admittedly, I only tried one season of the Monogatari series a fair while ago but while I found parts of it I really liked, I found watching it to be less than pleasant. The scene transitions, some of the interactions between characters, and just the general tone never really sat right or drew me in (and I know I’m a minority as lots of people love it). 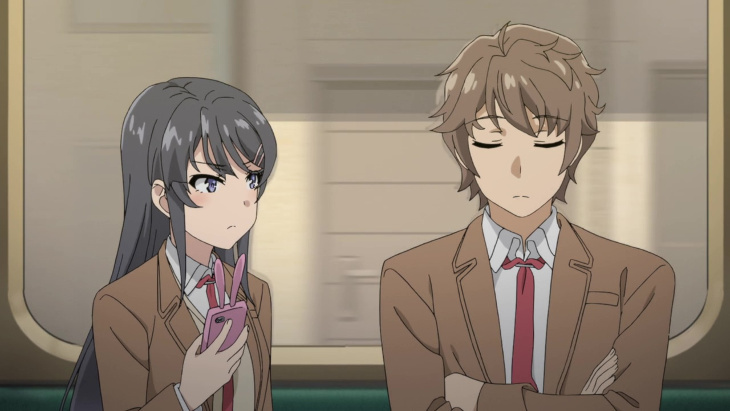 With Bunny Girl Senpai, from episode 1 I was drawn in to the story and the characters. The tone and execution just make me want to watch more of it. It’s definitely a better fit for me at least.